With recent advancements in energy technologies such as solar, wind, fuel cells, storage, LED lighting systems and building controls, the pressure on energy managers to lower energy consumption and cost across enterprise facilities portfolios has never been higher. Indeed, traditional energy and facility managers have taken on a new title – sustainability professionals – tasked with processing massive amounts of system data to effectively lower energy cost and ensure operational compliance within increasingly complex government and enterprise mandates. Fortunately, energy management technologies have likewise improved. Leveraging the Internet of Things (IoT) and cloud-based, service delivery systems, smart building solutions are changing everything – and ENTOUCH is leading the way. Need to make a business case? We can help you. Here is your guide to why ENTOUCH will boost your bottom line. ENTOUCH unifies your facilities portfolio, including legacy systems, onto a single platform for tracking HVAC, refrigeration, lighting and energy costs. Our dashboard provides you with a real-time view of every unit, property, region and division in your enterprise, flagging impending service calls before they get expensive, identifying system “outliers” for proactive management, and helping you enforce operating policies with permissions and overrides that put you in total control. Incorporating advisory services, advanced controls and wireless technologies, our cloud-based facility, asset and energy intelligence platform consistently delivers in excess of 20% energy savings annually. According to the U.S. Small Business Administration, an energy savings of just 10% annually equals a 1.55% increase in net profit margins and an added $25 per square foot in equivalent retail sales. No matter what business you’re in, that’s a significant return on investment. 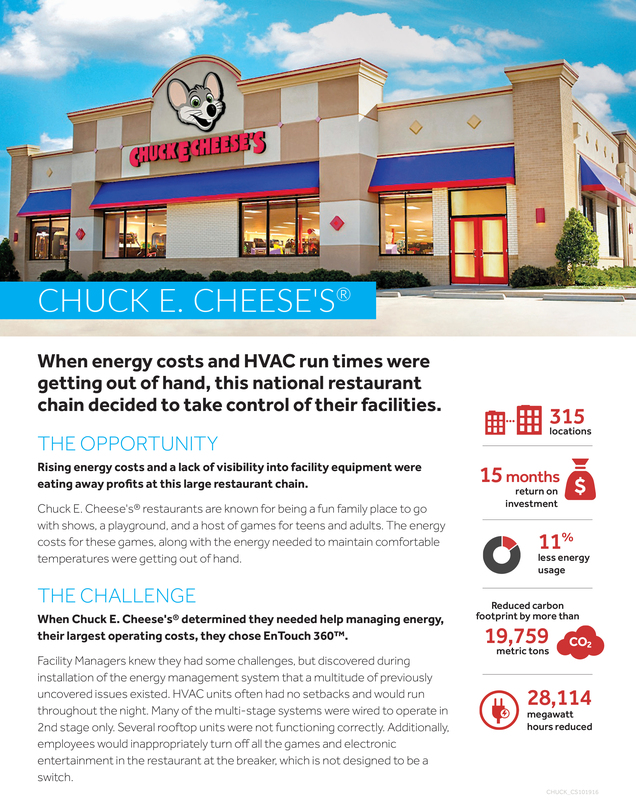 When an energy manager adds it all up, our low cost of entry, labor savings, energy efficiency, lower maintenance cost and extended asset life returns an average of $2 to $4 for every $1 our customers investment with us.